Need to level up your dating prospects? Get THIS kind of dog. There’s only so much you can do to look more attractive. And most of it costs a lot of cash and takes a lot of time. I’ve spent tons of money since my teenage years trying to look better, from clothes, makeup, and hair dye, to tanning booths, gym memberships, and teeth whitening strips. All of that helps, but what if there was another, better, more fulfilling way to become more attractive to potential partners? According to a new study by Petsies, there is! Oh, and it involves dogs. During the study, about 1,000 people were showed photos of potential partners, holding various sizes and varieties of pets. What they found is that certain kinds of pets made people more attractive to those looking at the photos. The photos used cats, kittens, large dogs, medium dogs, small dogs, and puppies. The findings were quite different according to gender. 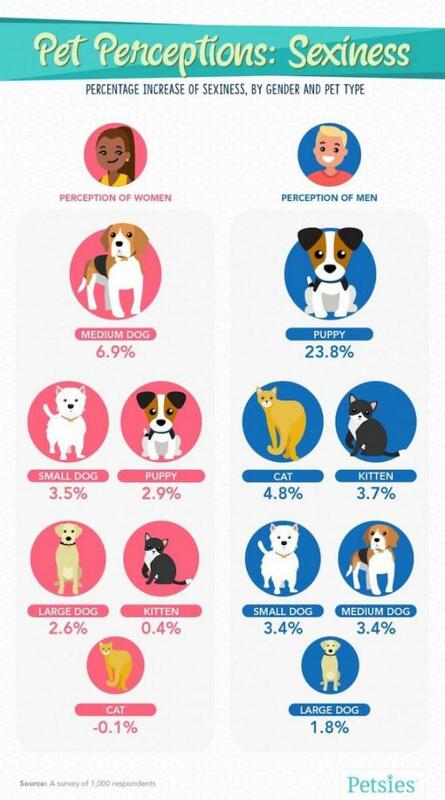 For females, the pet that made them look the most attractive were medium sized dogs, with small dogs coming in second and cats coming in last (wait, so this might explain a lot about cat ladies and their tendency to be alone). When it came to men, it was those holding puppies that were seen as most attractive, with cats coming in second and large dogs coming in last. Going by the survey results, women are about 7 percent more attractive to men if they are holding a medium sized dog! For guys, they were perceived 30 percent more attractive by women if they had a puppy in their arms. This survey might be the best thing that you read all week because you now know that just carrying around your pet will make you instantly hotter. Instead of straightening my hair this week, I might just borrow my friend’s medium sized dog and see how things go.